Cin Cin Wine Bar in Los Gatos may be named for the Italian toast that means “to your health,” but the food by Executive Chef Chris Schloss goes beyond that with an eclectic global mix — from Korean tacos stuffed with bulgogi-style shaved rib-eye to South Carolina pulled pork sliders to three-cheese arancini fritters to soba noodle wraps. The restaurant has attracted crowds since it was opened three years ago by long-time South Bay restaurateur Don Durante and former Google marketing professional-turned-sommelier, Lisa Rhorer, whom I had the pleasure of first meeting years ago, when we were both students in a wine class at the Culinary Institute of America at Greystone in St. Helena. It’s no surprise that the wines here take the spotlight as much as the food. The selections also span the world — from France to Italy to Spain to Argentina to California. 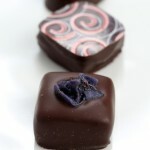 They are offered by the 3-ounce or 6-ounce pour or by the bottle. Or best yet — in imaginative flights, which is what my friend Donna and I enjoyed when we dined here recently. Although we paid our tab, the chef sent out some extra treats on the house that he wanted us to try. 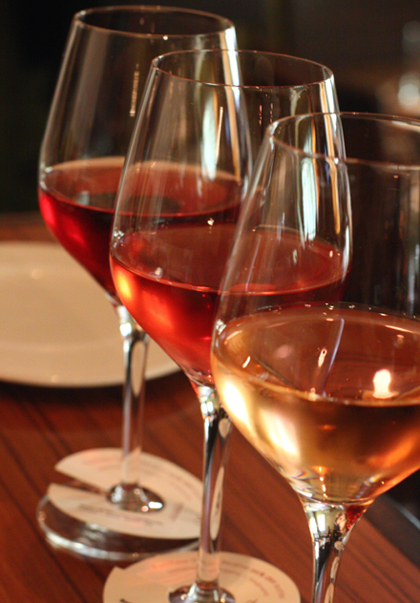 On a warm evening, you can’t go wrong with the rosé flight ($12), a trio of dry yet fruity summer wines that included Unti Rosé of Grenache/Mouvedre, Sonoma County 2010; Castella di Ama Rosato, Tuscany 2010; and Villa Creek Rosé of Grenache/Mourvedre/Carignan, Paso Robles 2010. The boisterous dining rooms are outfitted with rattan chairs and green-hued, grasscloth-covered walls, lending a casual, almost tropical hideaway vibe. The menu is divided into “nibbles” ($4 to $7); “small plates” ($9 to $14) and “large plates” ($13 to $27), making them ideal for sharing. 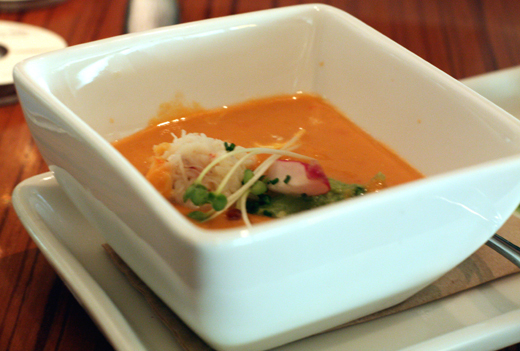 We began with a refreshing, smooth Andalusian gazpacho garnished with Dungeness crab that had lovely body, creaminess and just the right spicy kick. 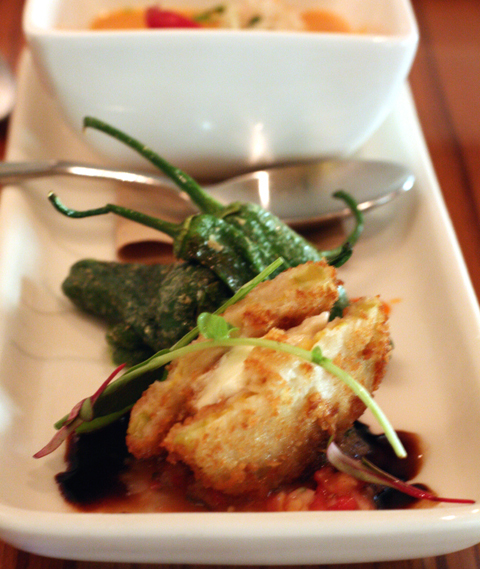 Alongside were fried green tomatoes that were bright and acidic, with gooey Explorateur cheese to round out the flavors. You’ve probably never seen huevos rancheros like they are served here. There’s tortilla, salsa and guacamole to be sure. 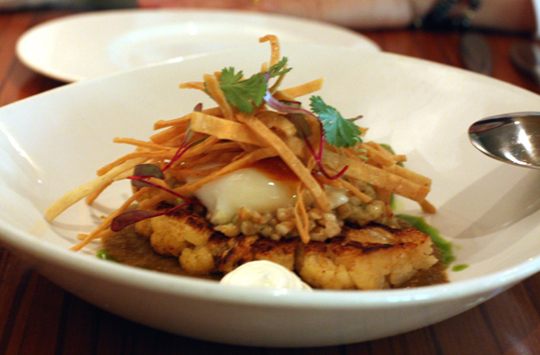 But there’s also a cauliflower steak cooked sous vide crisp-tender, quinoa and a runny 63-degree egg. Puncture the yolk and stir it all up. It’s one hot mess you can’t stop eating. 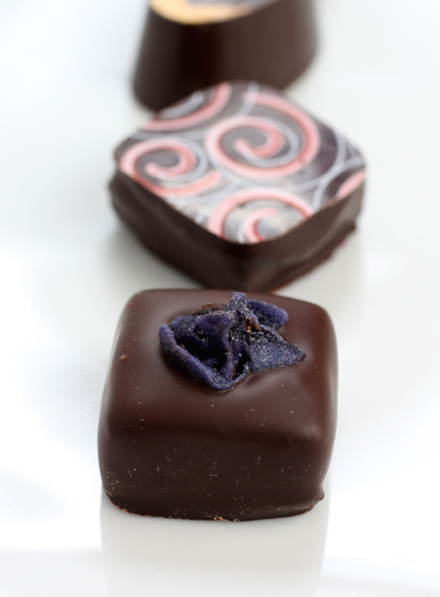 Every forkful brings new textures and flavors from creamy to crunchy, from spicy to cooling. 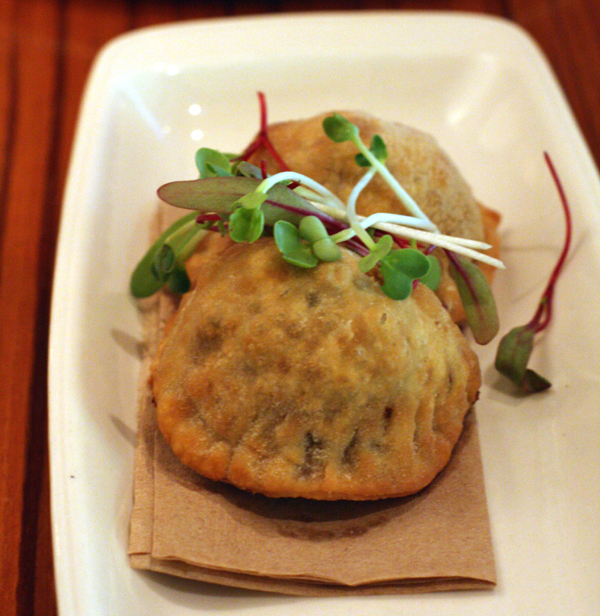 Empanadas hold a filling of earthy wild mushrooms and pungent Manchego cheese with truffle oil. In need of even more of a truffle oil fix? 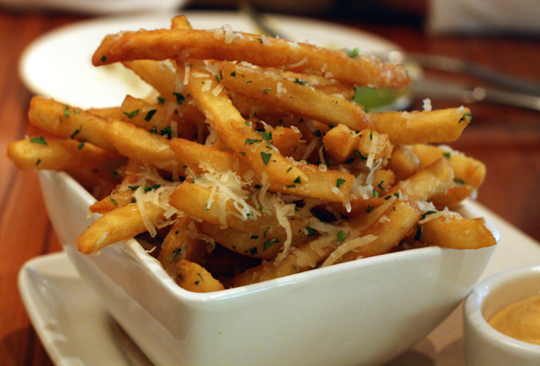 Order a side of truffled french fries with a shower of Grana Padano over the top. The fries are super crisp with airy interiors. Aioli comes on the side for your dipping pleasure. I have never had tempura-fried bok choy before, but once you try it, you wonder why more places don’t do it. First, it arrives looking gorgeous — snaked on the plate and covered in a crisp, golden, lacy batter that gives way to the tender greens, the bitter flavor of which has been mellowed a bit by the frying. The tempura bok choy is merely an accompaniment to the togarashi-sesame seared ahi tuna that’s the centerpiece of the dish. As you dig past the fish, you’ll find sweet cubes of mango, creamy charred chunks of avocado and — of all things — tiny spaetzel hiding below. While the avocado was a nice smoky surprise, the spaetzel might have been a case of overkill. After all, why pile on the flourishes when you already have tuna seared so perfectly and winning tempura bok choy taking such star turns? 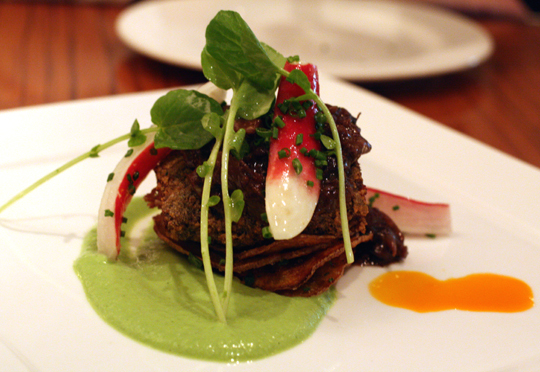 The evening’s special of beef cheeks arrived with a beautiful crust and beyond tender flesh. It’s a dish that will have you sinking back in your chair happily with a bold glass of Cabarnet in your hand. 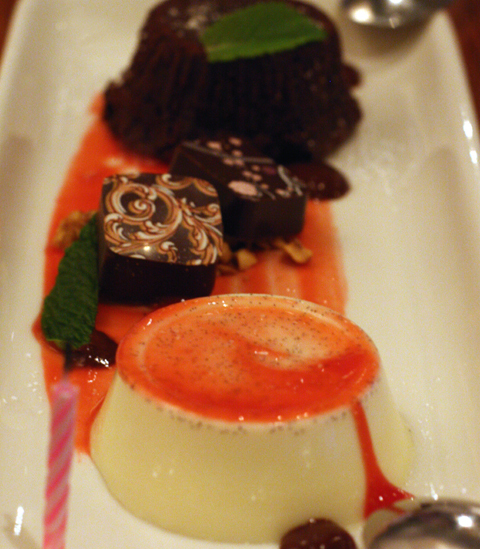 Desserts are all $8 and generous in size. We shared the chocolate souffle cake with molten center, which also came with a ricotta panna cota — a nice contrast of warm with cold. Cin-Cin also used to garnish this plate with two Luis Moro chocolates, hand-made in Santa Cruz, but it recently stopped doing that, unfortunately. “To your health” has never sounded more fun than it does at Cin-Cin. It’s a fine place to kick back with friends to drink to exactly that. A delicious looking meal! I really like that ahi dish and the dessert. Lovely! I agree. I think spaetzel might have been overkill, especially if the bok choy and fish are already wowing you. Good food AND good wine, what a winning combo! I agree that Rose is the perfect summer drink although it feels NOTHING like summer here right now! 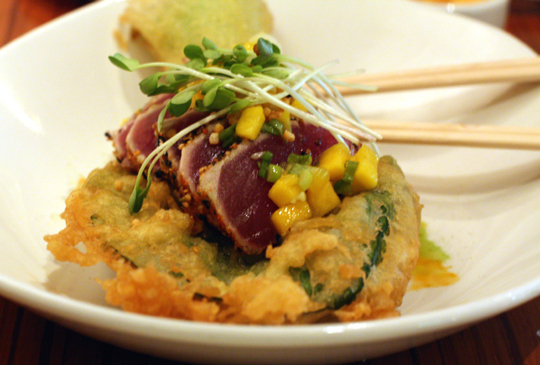 The tempura bok choy with the seared tuna and mango gets my vote. I can imagine how fluffy and crisp from the look of that batter. a lovely evening,beef cheeks ahh divine. Rose for a summer evening. great idea! Everything looks delicious! I think I’d be hardpressed to have a favorite. I love a good wine bar and this place sounds awesome! I love wine bars! And usually (as is the case here) the food is fabulous. Small menus, but beautifully done and presented.